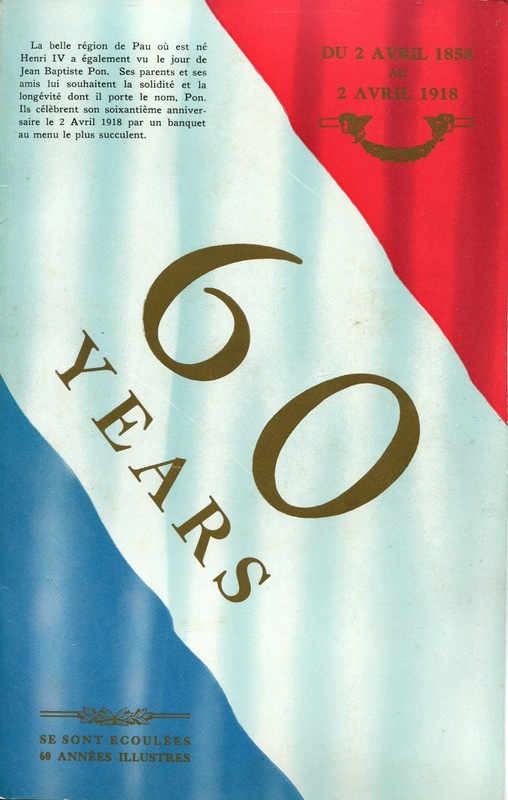 The 6¾- x 10¾-inch menu was produced on a blank card with a tri-color cover. Although this card stock was employed for other special occasions, the design of this particular menu has a homemade quality about it. The number “60” is printed in large, bold characters on the interior pages, making the dishes difficult to read. Mailhebuau, who was the paterfamilias of this tight-knit group of friends, relatives, and fellow restaurateurs, probably designed the menu himself. (His young daughter appears on the guest list as “Yrene,” reflecting how Irene is pronounced in French—she can be seen on the other side of the table with a giant bow in her hair.) 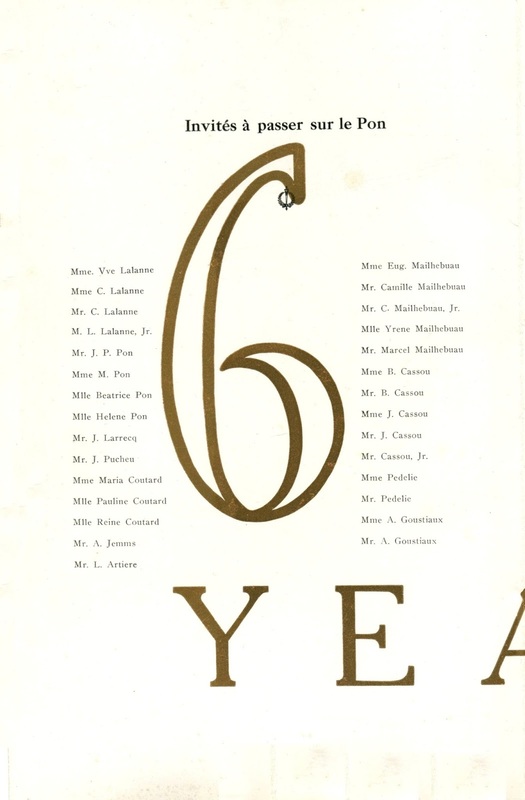 We previously encountered some members of the clan in the essay A Moment in Time, recounting an anniversary party in 1920 when Prohibition was about to go into effect. This dinner opens with oysters accompanied by Henri IV sauce, named after the sixteenth-century French king from Pau, the commune in the Pyrenees where Jean Baptiste Pon was born. 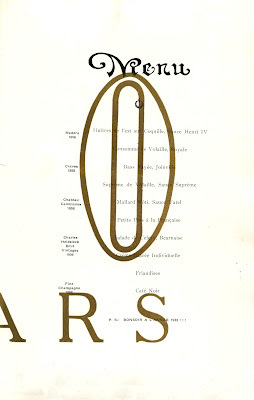 The wines are also symbolic. 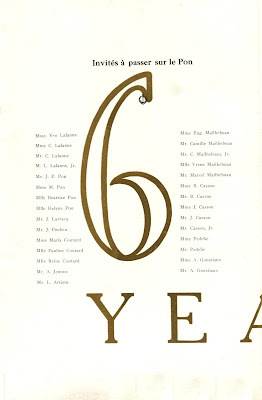 Astonishingly, four of them come from 1858, the honoree’s birth year. 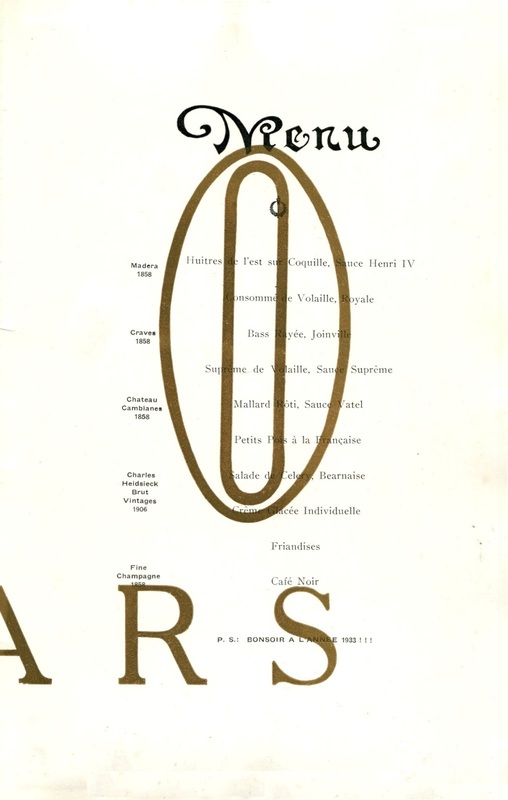 At the conclusion, there is a strange toast: “Bonsoir a la Annee 1933!! !” The date immediately brings to mind Prohibition which was repealed on December 5 of that year. 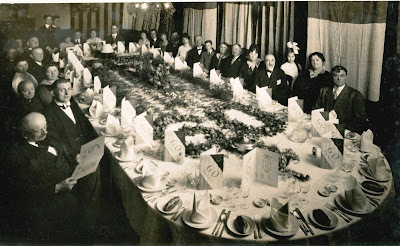 However, at the time of this party in 1918, they could not have known that the Eighteenth Amendment would be enacted, nor could they have imagined the extent to which this national fiasco would decimate fine dining in the United States. The partner's menu reading seems quite rude considering how hard it is for a photographer to get everyone in place for a group photo such as that. The toast probably looks forward to gathering again in 1933 to celebrate Pon's 75th birthday.